Last year I had a passing thought: What if I did a huge project for charity and made art for a large audience? This idea came about after making some new artist friends who create large scale paintings during events. It's painting as performance art! People get to watch the entire piece develop over the course of a few hours or days, depending on the event. After they're finished, the painting is available for purchase. (Shout out to Crispy Printz! They are such an inspiration to me!) As with most of my ideas, it starts out with I WANT TO DO THAT! And so I figured out how I could. Here's a peek into my thought process: I could paint one huge thing, but then who would buy one huge painting? So think smaller...that means multiples of one idea. Cool. How about 100 of something? Got it. How about a local charity that helps feed children? Perfect. How about setting up at a local BBQ and music festival that was created to benefit volunteer firefighters? OMG THAT'S IT! Since it's a small town, I had a direct connection to the folks in charge of Smoke on the Water BBQ Cook-Off and Music Festival. I typed out a quick message and just like that I had myself a new project to work on! Looking back at my messages, it looks like I got the idea approved last year. So I had plenty of time to work out the details. Buying 100 canvases would be expensive, so my dad and I spent an afternoon cutting down three sheets of birch plywood. For a little over 70 bucks, I had plenty of panels to paint. But what was I going to paint? What do people like? Well, since I'll be setting up at a BBQ fest, why not PIGS! People love pigs! 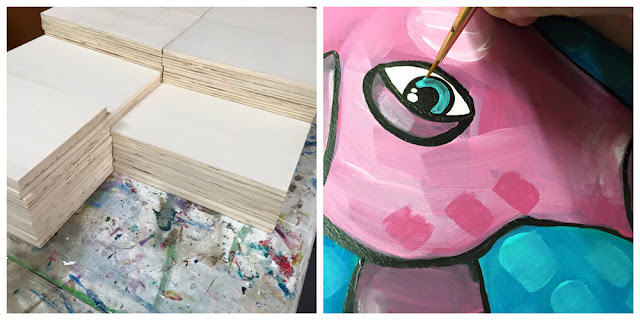 This project is called "PIGS FOR KIDS" and I'll be painting 100 8"x12" pigs on wood. 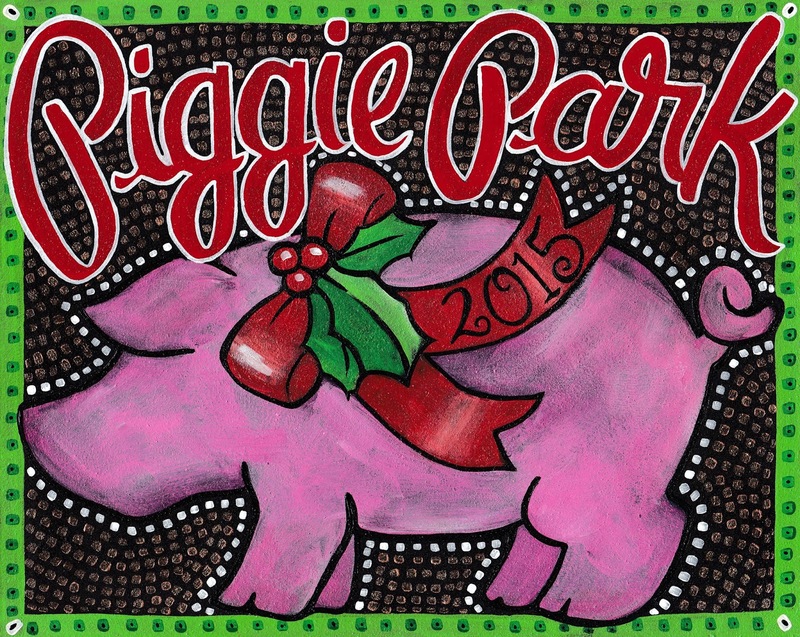 Each pig painting will be $40. ALL of the proceeds benefit Food for Thought, a volunteer non-profit group dedicated to making sure Thomaston, Georgia schoolchildren don't go hungry. Children in the program receive a food bag every Friday afternoon to take home for the weekend as well as bags for school break periods. The group is in their fourth year and puts together almost 7,000 bags every school year. The bags of food cost about $4 each. Like I said before, it's a small town and I know the folks in charge of Food for Thought. I ran the idea by them and they happily agreed! So there you go, you have the WHO, the WHAT, the WHEN, the WHERE...but what about the WHY. Why do I feel compelled to do such a huge project? And the answer is just a simple because I want to. I live a very sweet life & I'm very fortunate in so many ways. Why not use my talents and abilities for good if I am able to? 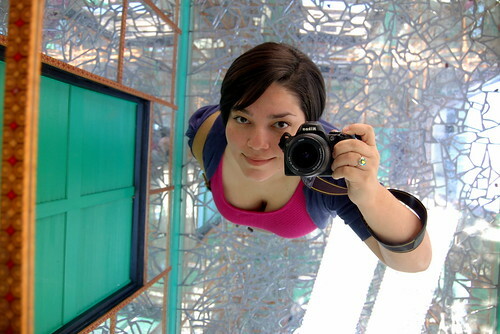 Besides, I love doing passion projects like this to keep my creativity flowing. It's a win-win-win all around! I started painting on February 27th, 2016 and today is March 31st. 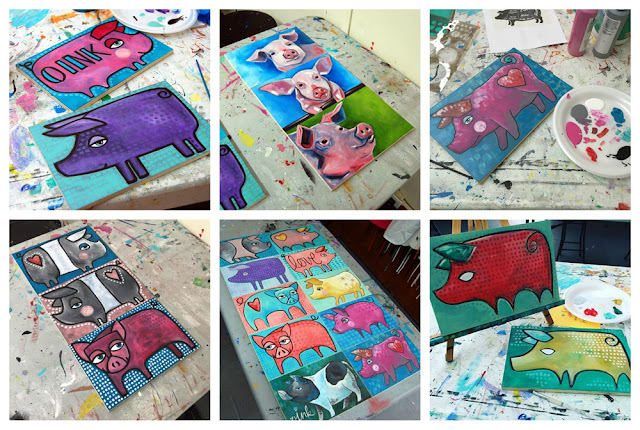 So far I have created FIFTY pig paintings. That means I have grossly underestimated my ability and my time to paint so many pigs. I'm right at the halfway point and the deadline is well, tomorrow. BUT GUESS WHAT! It's my project and I can extend the deadline if I want to. I'm still setting up at Smoke on the Water this weekend. 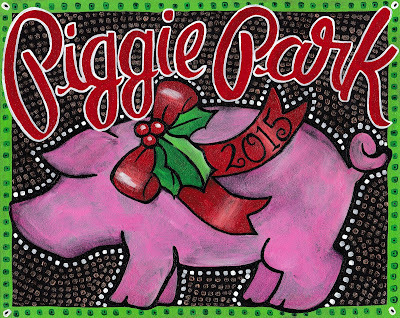 And I have plenty of pig paintings to sell. 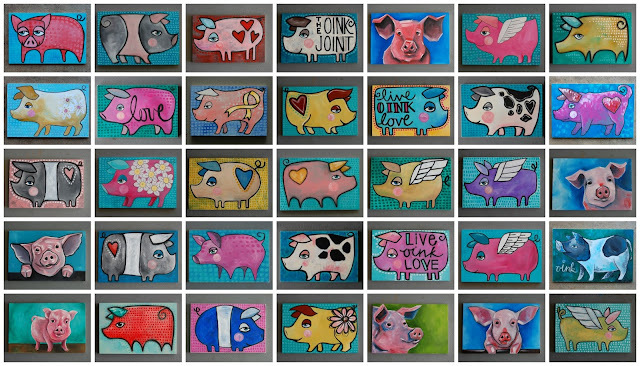 Here are 35 random pigs from the 50 that have been created. Hopefully they all find new homes soon! 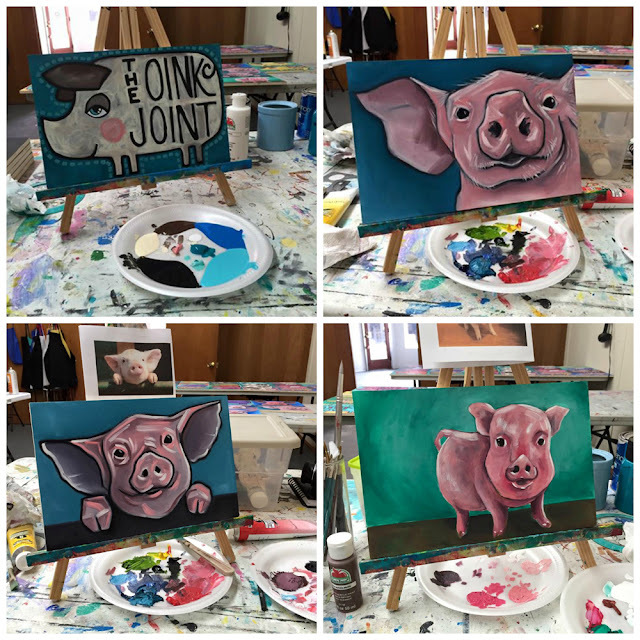 If you're on Instagram, follow my progress at @Fawne or #Pigs4KidsProject. 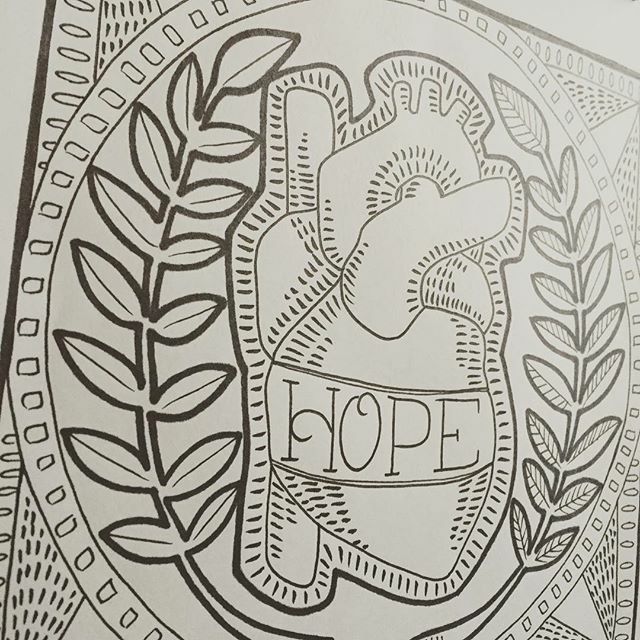 Every few weeks I work on a project for my town's Free Art Friday. A few weeks ago, I made a note that the first Friday in February would be FAF day, but hardly made any plans to work on anything. With the deadline looming, I made an art supply run and wandered around Michaels for inspiration. When I'm trying to come up with an idea for free art I have a few criteria: small, inexpensive, transportable, and easily created multiples. This way more people can find and enjoy the art. I found these small birch tags in the wood section. I got two packs of twenty and a pack of 50 magnets. Armed with my trusty tube of E6000, I got to gluing. *Please note: I usually work in my studio but this afternoon I was waiting on a very important delivery. I decided to work at the kitchen table that faces the southwest and the bright setting sun was coming in through the windows. Using a paint pen to add some blue dots. All random, just filling in the space. Adding another layer of color. I used a Sharpie marker to draw hearts over the painted dots. When all of that dried, I brushed on a coat of Mod Podge to seal in the design. Voilà! Little love magnets. Cute art that doesn't break the bank! It's going to be pretty fun setting these up around town! Listmaking is one of my favorite hobbies. The best time for list-making is at the end of a very exciting and interesting year. After the Christmas holidays, in that weird, slow week before the New Year, I always spend a lot of time reflecting on the year and what I've been up to. 2015 was a strange time, really. I was thinking that I didn't do as much as I've done in previous years, but when you get everything down on paper, you're able to see for yourself that YES, you got some work done! It's an incredibly validating experience. Let's get back to what I said earlier: 2015 was a strange time, really. It was strange because I finally FINALLY decided that I am unable to make as much money as I need through art alone. It's a sad and humbling realization that what you've been working towards for many years just isn't sustainable. So I got a part-time job as a server. Yes, I'm waiting tables again after a 14 year hiatus. And the GOOD news? I enjoy it. And the GOOD GOOD news? I have a steady stream of money coming in! This may be a topic I can write about in a future blog post, so I'll save most of my thoughts for that. 2015. What a long, strange trip it's been. I'm looking forward to the fun of 2016. 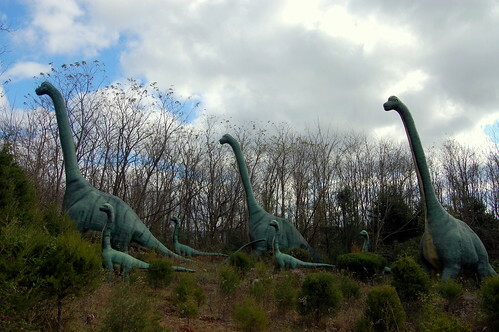 Dinosaur World! 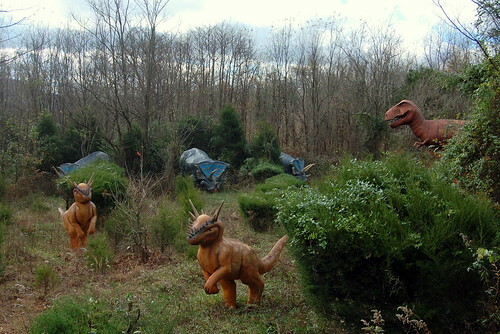 You see this on the side of the highway and OF COURSE you have to go! 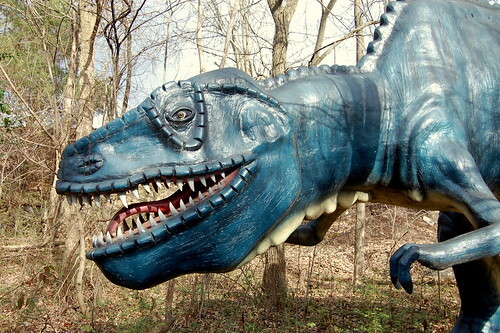 Cave City is full of delightful, fun spectacles in the middle of nowhere America. We already checked out the Wigwam Village and a cave, so after the sun came out the next morning, Maz and I explored this great roadside attraction. 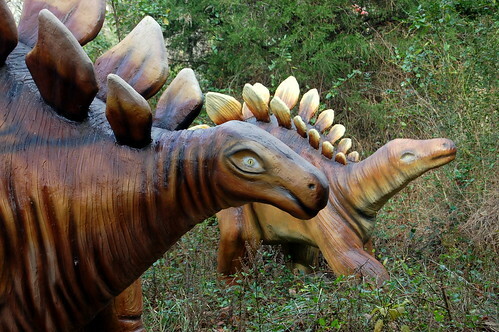 Dinosaur World is simple: over 150 replicas of various extinct reptiles spread out over 20 acres of land. Simple...but SO MUCH FUN! 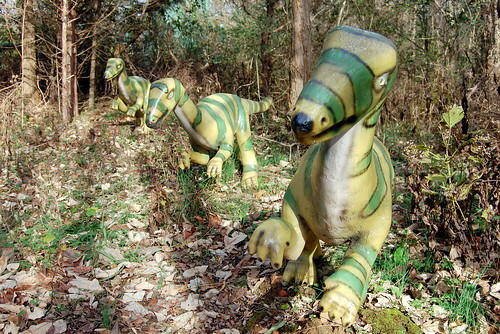 After paying an admission fee, you're set loose to follow a trail around the grounds. 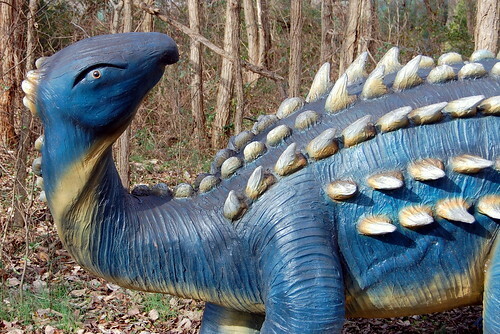 There's a dinosaur or two every few feet with a small placard displaying information about the species. The temperature was hovering just above freezing and we were on a strict travel schedule so we couldn't spend too much time standing still. It took us about an hour to cover the entire space, but I could see spending a few more hours there if you had smaller kids. There's a playground that could keep little ones entertained for awhile. 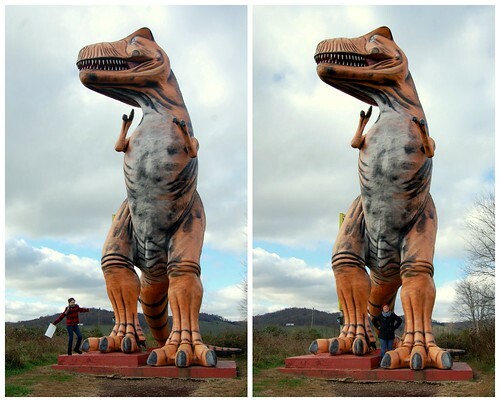 We had to pose with the large Photosaurus! We got a couple of honks from the highway, too. 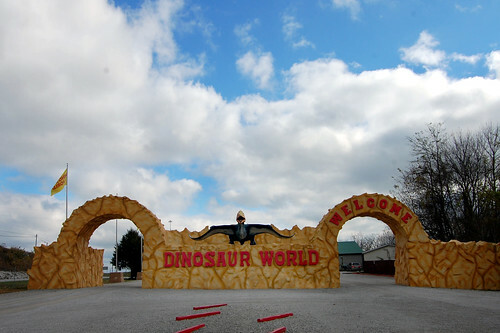 As long as you don't take your dinosaurs too seriously, you and your family could have a nice afternoon at Dinosaur World! 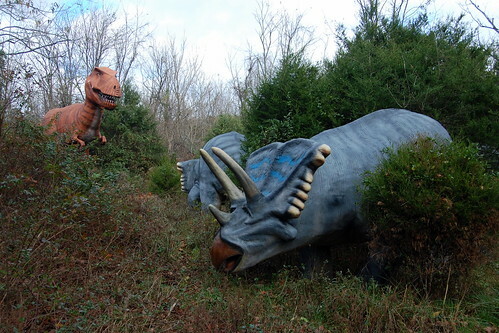 By now you should be familiar with my fondness for weird roadside attractions. While planning my annual roadtrip to Michigan to visit family, I knew that I wanted to stop mid-way for a rest (my younger days of driving 14 hours straight through are officially over!). 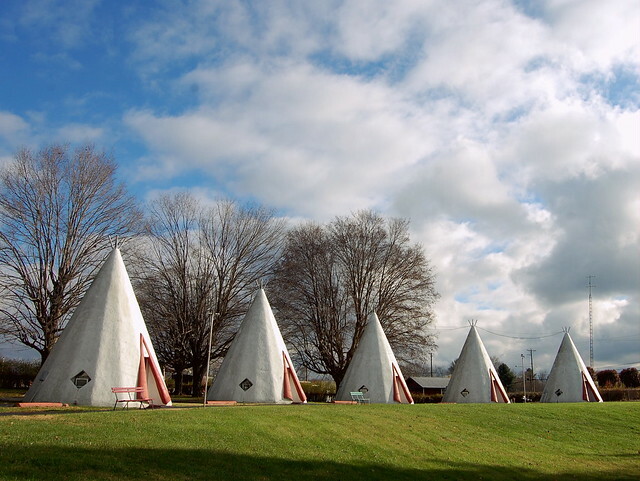 So I fiddled around on Roadside America and discovered that the Wigwam Village #2 wasn't too far from my route. I have to add that I'd seen where Kaylah of The Dainty Squid has stayed at all three Wigwam Villages. I'm pretty sure this is how I discovered the awesomeness of these unique attractions. I mean, how could you pass up staying in one of these?!? 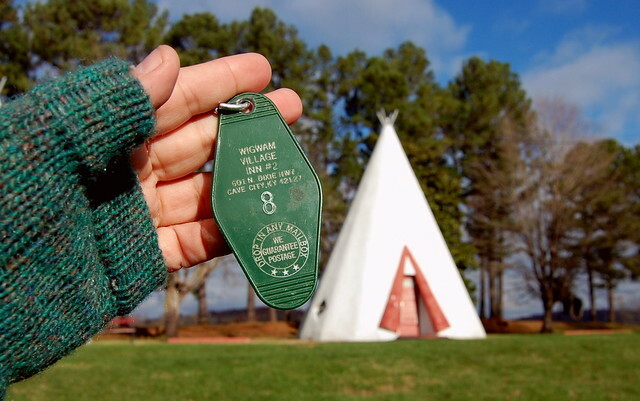 From their website: Wigwam Village Inn #2 is the most unique motel in all of Kentucky. It celebrated 60 years of colorful history in 1997, and staying there will be an experience you will never forget. We spent the previous day driving through nasty rain so I was glad to see a bright sun and clear skies the next morning. From Wikipedia: The diameter at the base of each tipi is 14 feet (4.3 m), and they are 32 feet (9.8 m) in height. Behind the main room of each unit is a small bathroom with sink, toilet, and shower. In 2008, the rooms contain the original restored hickory furniture and a window-mounted air conditioner. There are no telephones to maintain the original atmosphere of the motel, but the rooms do have cable TV and internet access. 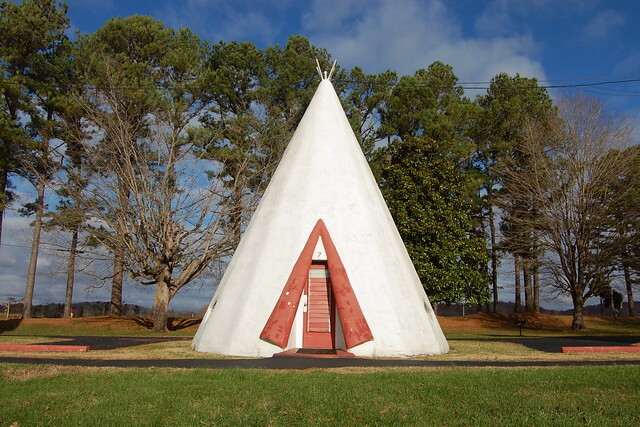 Wigwam Village #2 is listed in the National Register of Historic Places. Thank goodness for the wi-fi! I could not figure out how to get the cable tv working, so we at least had the internet to keep us entertained. The room itself was very drafty, especially around the door and window AC unit. It was an extremely windy night due to a cold front barreling through. There was a small space heater in the wigwam that kept us at a comfortable temperature. That thing was a champ! Staying in Cave City was a treat! 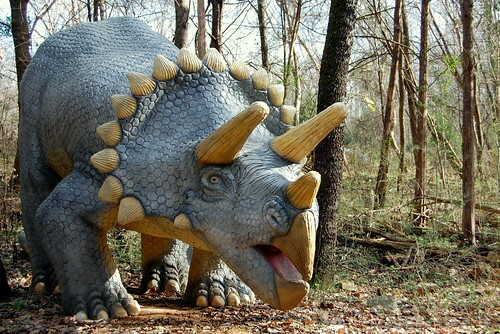 We visited Onyx Cave for a short, inexpensive tour. Our tour guide was obviously excited about the cave and science in general, which makes an already interesting experience ten times better. Dinner at El Mazatlan was HUGE and very satisfying after a solid 7 hours driving. After telling my husband of all the fun things we did (and all the fun things still left to do!) 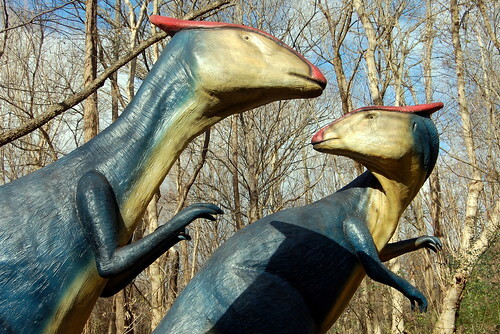 we decided that we should definitely try to go back to Cave City, Kentucky. 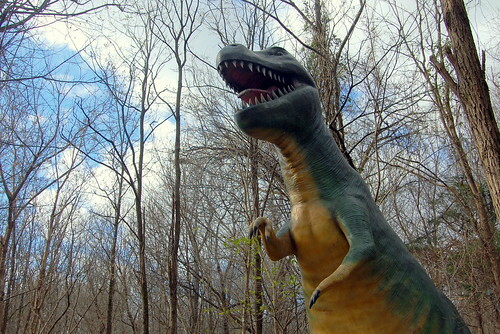 & I have to tell you about our visit to Dino World! Sign Up to Get Art News!